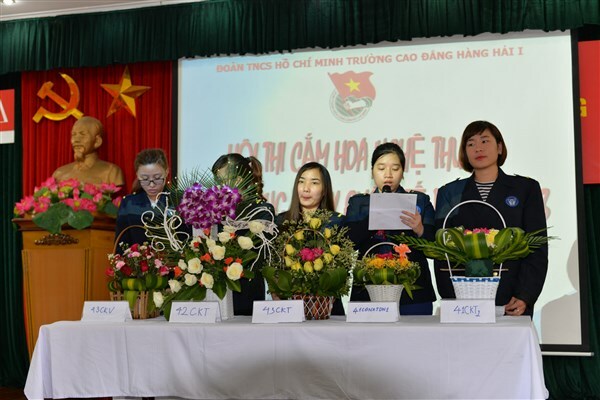 From 13.30 to 17.00, at the meeting hall A3 of Maritime College No.1, the Labor Union of Maritime College No.1, in association with Ho Chi Minh Communist Youth Union of the Maritime College No.1 organized “Flower-Arrangement-competition” among female students, “Ms.. 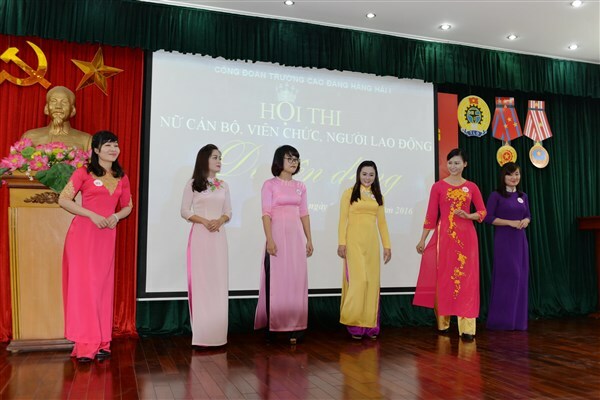 Elegant and Charming” contest and “the 106th Anniversary of Vietnamese Women's Day March 8th and 1976 years of Hai Ba Trung revolution (9/3/2016). 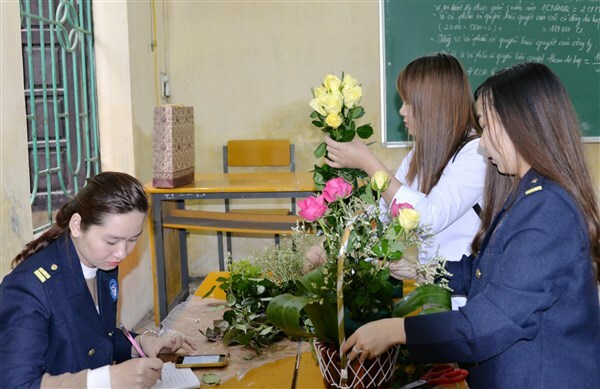 Early in the afternoon, selected female students eagerly participated in the “Flower-Arrangement-competition” in 5 groups of three members. 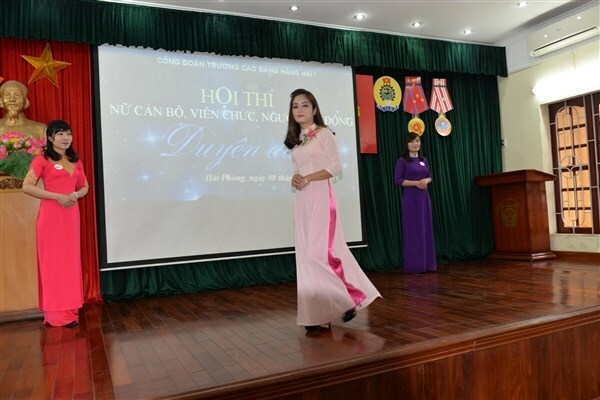 Flowers were arranged on the theme of “Vietnamese women”. After the time allowance of 60 minutes for each group, all flower arrangement ideas were shown on the stage for being presented about the ideas. Final result: Team 42CKT won the first prize for their flower arrangement idea on the theme of “Mother’s love”; Team 43CKT won the second prize for their flower arrangement idea on the theme of “Enlightenment”; Team 43CKV won the third prize for their flower arrangement idea on the theme of “Honor”. + First: Labor Union of Faculty of Basic Sciences, Foreign Language Division; Human Resource Development and Labor Export Center; Maritime Professional Training Center and Foreign Language and Informatics Center. + Second: Labor Union of Accounting - Finance Department; Faculty of Ship Navigation; Faculty of Marine Engineering Operation; Faculty of Mechanical Engineering; Faculty of Economics and Informatics Division. 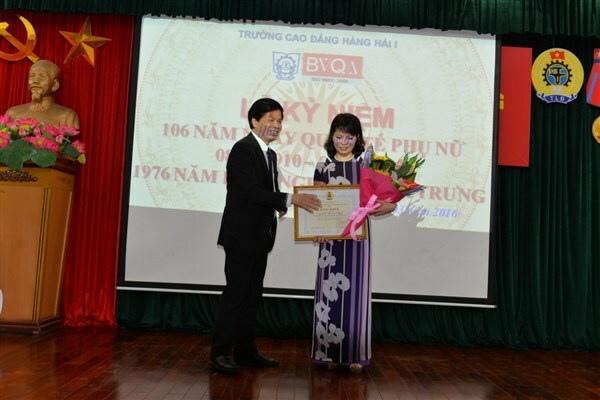 + Ms. Phung Thi Ha – a teacher and an official of Training Quality Assurance Department won the prize for the best conducting competition. 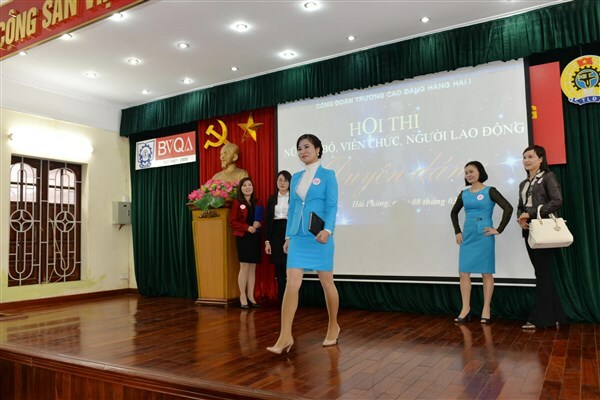 + Ms. Ngo Mai Phuong – a teacher of Foreign Language Division won the prize for the best costume performance. 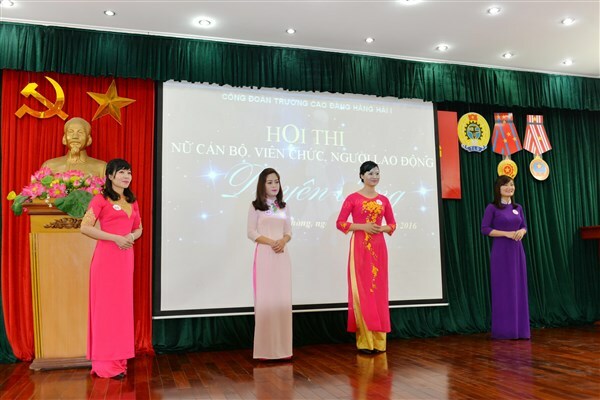 After these two contests, at 16.00 at the meeting hall A3, the 106th Anniversary of Vietnamese Women's Day March 8th and 1976 years of Hai Ba Trung revolution (March 9th 2016) was formally held. 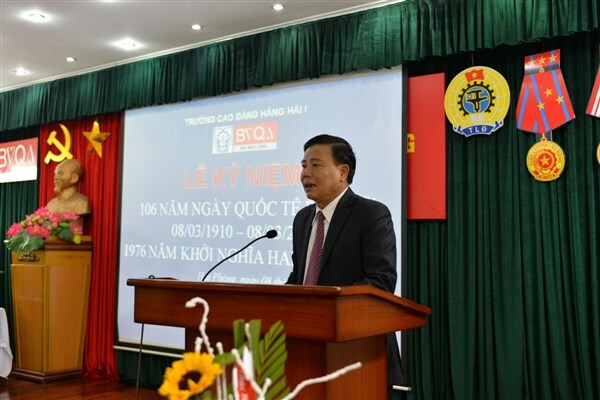 Among the attendees are Meritorious Teacher Phan Van Tai – Former Secretary of the Vietnamese Communist Party of Maritime College No.1 – Rector - Head of the Board for woman development, Mr. Dinh Gia Vinh - Secretary of the Vietnamese Communist Party of Maritime College No.1 – Vice Rector, Mr. Vu Van Dung - Former Chairman of Labor Union – Vice Rector; Ms. Vu Thi Hai Van – Chairman of Labor Union – Head of the Board for Woman affairs and representatives from the departments of Maritime Colleges; representatives from Labor Unions of the departments; female staff and students of the college. On behalf of the Board of Rector, Meritorious Teacher Phan Van Tai made a congratulatory speech to honor the contribution of the female staff to the development of the college. 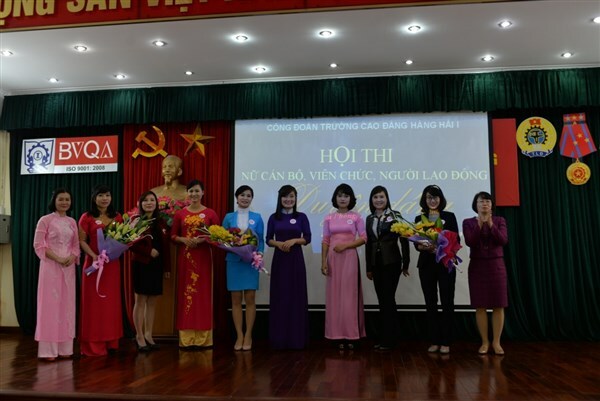 Mr. Dinh Gia Vinh, under the authority of Vietnam General Confederation Labor, awarded the “Certificate of Merit” to the female staff of the college.